Thanks to its nutritional benefits, pears play a key role for the benefit of our health and fitness. A pear is always the perfect snack for adults, kids, and anyone who practises sport and has a light diet. And, thanks to its many vitamins and antioxidants, pears are our day-to-day friend in looking after our bodies too. Pears are one of the most recommended fruits for diets, as they have a very low calorie count (35kcal/100g when peeled) and are very low in fat (0.1%). They are also rich in fructose, a natural sugar with a low glycaemic index and a uniquely sweet taste, restoring physical and mental energy without adding pounds on the scales. So, if you want a tasty, healthy snack, go for lightness: pick up your favourite Opera and start munching! Everyone knows that eating fruit is good for you, but pears are even better than most! This fruit’s nutritional properties can bring important benefits for your body. Indeed, pears have a high water content – with diuretic and detoxifying properties – are rich in fibre, including pectin and lignin that help regulate bowel movements, and contain lots of calcium and potassium for strengthening bones and improving blood circulation. What is more, the many vitamins found in pears (A, B1, B2, C and E) not only give you energy and strength to get through the day, but also contain key antioxidants that help protect the skin against the effects of ageing. 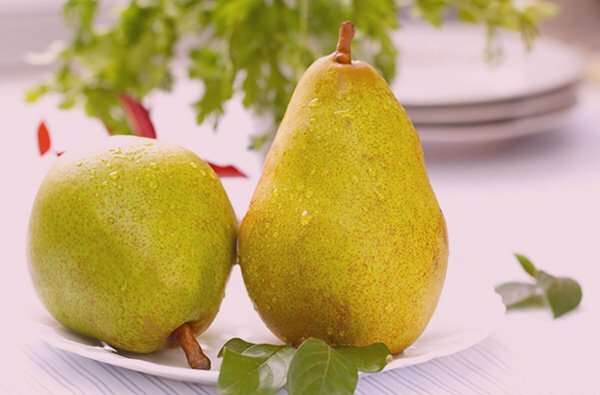 As well giving your diet a healthy and wholesome kick, an Opera pear can also bring out the beauty of your body. Thanks to its high vitamin content, pears are widely used when developing cosmetic products, such as moisturisers, and anti-ageing treatments, including face masks. If you want skin which is always smooth and soft to the touch, choose pears to be your new best friend. Does more fruit when pregnant mean smarter kids? More fruit to ward off disease. As confirmed by all scientific studies, the majority of the most serious diseases (and at least 30% of cancers) are caused by unbalanced diets: too many animal fats and a lack of vitamins and antioxidants. Here in Italy, home of the Mediterranean diet, awareness is also growing concerning the major issues of childhood obesity and lifestyles. For this reason, almost all diets today recommend up to 5 portions of fruit or vegetables per day. With their low calorie count and high vitamin and antioxidant content, pears are one of the healthiest and most beneficial fruits for our health. The diuretic and detoxifying properties of pears are linked to its rich potassium content (with a potassium-sodium ratio of 116mg to 1mg). Potassium is crucial when dealing with high blood pressure, being able to lower it. So, with all due respect to old wives’ tales, nowadays the American Heart Association declares that actually a pear, and not an apple, a day keeps the doctor away (by halving the risk of heart attacks). The most satisfying fruit there is, everyone knows it! Once upon a time, even a wooden marionette sated his hunger with the peel and cores of three pears. We all know this story, but who could have possibly imagined that this episode in Carlo Collodi’s Pinocchio had a scientific basis? Thanks to the high level of fibre in the flesh and peel, pears are without doubt one of the best fruits for satisfying hunger pangs. For this reason, as well as its low calorie count and high potassium content, the pear is often recommended as a snack between meals, and is in all respects a great food to form part of a weight-loss diet.